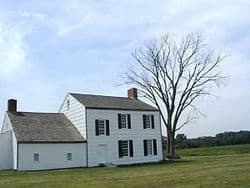 Monmouth Battlefield State Park is a 2,928-acre (11.85 km²) New Jersey state park located on the border of Manalapan and Freehold Township, in Monmouth County, New Jersey, United States. 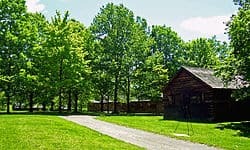 This park preserves the historical battlefield on which the American Revolutionary War’s Battle of Monmouth was waged. Monmouth Battlefield State Park preserves a rural, eighteenth century landscape of orchards, fields, woods and wetlands encompassing miles of trails for hiking and horseback riding; picnic areas, and a restored Revolutionary War farmhouse entitled, the Craig House. 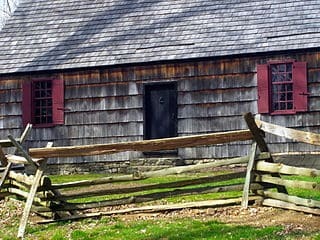 The park’s visitor center rests atop Combs Hill―a hill once commanded by the Continental Army artillery. Within the park’s visitor’s center one may observe an array of excavated artifacts from the notable eighteenth century battle. On December 5, 2011, the Monmouth Battlefield Visitor Center was closed for renovations through Spring 2013. The renovated Visitors Center was officially reopened on June 13, 2013. During the final weekend in June (or the weekend nearest to 28 June), an annual reenactment of the 1778 American Revolutionary War battle is performed. 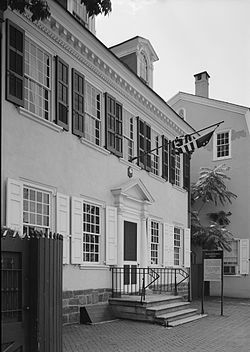 On June 28, 1778, as Sir Henry Clinton and his troops departed from the Monmouth Court House, George Washington and his Continental Army troops plotted an ambush on the rear column of Clinton’s British Army soldiers. It became one of the largest battles of the American Revolution. It took place in the fields and forests that now make up Monmouth Battlefield State Park, though the battle soon ended in a standoff. The Battle of Monmouth is notable for creating the American legend of Molly Pitcher, a housewife who boldly took her husband’s place at the cannon only moments after his peril. In honor of Pitcher, an aging white cenotaph was erected near the property of the battlefield.